-1- I've been doing a lot of teaching for the start of this semester, and so far everything I have taught have been small group sections of a larger world civilizations course. So, it's the same material, the exact same assignment, for each of these, and I have *10* in total. I've taught 3 so far and I'm already sick of my own voice and my interspersed humorous anecdotes, so this does not bode well. But I'm hanging in there. I have more of these classes today and the end of next week, then thankfully I can move on to English Composition. My goal is always to keep these sessions as interesting and lively as possible, but there is inevitably somebody in the back (usually wearing a hoodie, for whatever reason) who is on the brink of nodding off, especially if the class is at 9 am, which many of these are. I do what I can. :-\ But honestly, the large majority of students seem engaged, so one has to focus on the positive, right? This is going to be a shorter than normal quick takes because I have two hours of teaching beginning at 9 am. Wish me luck! And I'm working on the coordinating hats. I'm enjoying picturing their little heads squeezing into them. 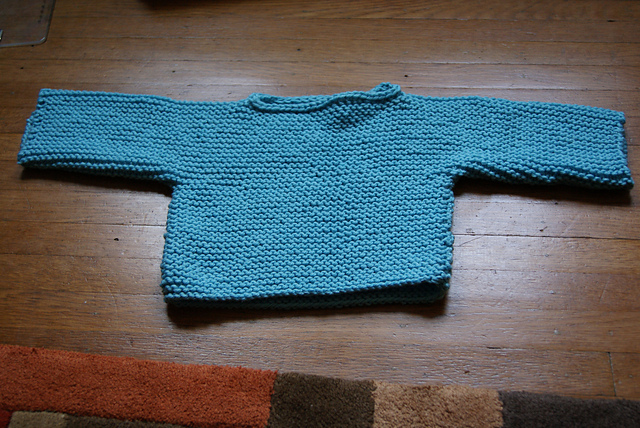 I'm also working on some other gifts, but they are top secret, since the recipients read this blog. 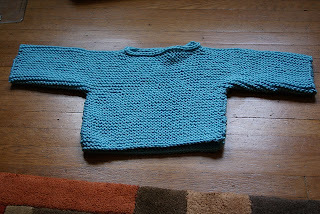 :) It's a good thing I've been able to cross things off of my crafting list since I have more yarn arriving today. Amount of guilt that I feel about this: ZERO. I am a good steward of my yarn, using it to bring joy to others. -3- I mentioned a few weeks ago that I was thinking of taking a Flamenco dancing class. There is a local teacher who is setting up shop in the studio that I belly dance at, and she is the ONLY Flamenco teacher in this whole area. The class is Tuesday evenings, and I had to make a decision, since classes started this week. After a lot of soul searching, I decided not to do it. Mike teaches one night per week, Henry has Cub Scouts, and I belly dance every Friday night. We really don't need to add more to our family schedule right now. As I was looking at the history of the dance, the costuming and techniques, I was thinking that I'd most likely love it. The problem with that is that I *already* love belly dance, and I'm very invested in it, with weekly classes, frequent performances, and 4 professional costumes. I don't need to add more time commitment and money into dance right now, when I do have something that I love. If I were single and without children, it would be totally different, but that is not the case. So alas, no Flamenco for me, at least not now. "Hey, let's practice improvising by dancing to *each other's* music/music we have never heard before!" That sounds great after 2 glasses of wine, but when you're stone cold sober on a Friday night in front of your respected peers = not so much. But Claire was there and she loved the idea (we shouldn't have given her that wine...), so in a few weeks we're putting a playlist on shuffle and improvising. I'm certain that some blog-worthy things will happen. -5- But speaking of not wanting to over-schedule oneself, another reason why I turned down taking on an additional dance class is because parish activities are starting up again and I want to be free to volunteer. I'm not teaching for the Children's Liturgy of the Word program this year, but I'd still like to be more involved in the parish. So I'm scouring the bulletin each week for the right opportunity. I'm not certain exactly what I want to do, but I'm sure I'll be inspired by something. Here's hoping. If you all would pray for me on this intention, I would be most humbly grateful. -6- This is in no way related to any of the above, but it's still an interesting little tidbit. About two weeks ago, Mike asked if I would watch a silent film with him that he's always wanted to see, and he could now record via the miracle of DVR. Did I mention that we now have DVR? We're one of the last people in the free world to acquire this, based on some of the reactions I have gotten. We're a little behind on technology (read: we're cheap). Anyway, he wanted to watch a silent film from 1927, Alfred Hitchcock's The Lodger: A Story of the London Fog. I have to say, I was very pleasantly surprised. Hitchcock did interesting work, but this was obviously one of his earlier pieces, and I didn't know if a silent film would hold my interest. It definitely did. In a nutshell, it's the story of a serial killer stalking young blonde women in London, and what happens when a mystery man checks into a local boarding house. The couple who own the house have a daughter living there who matches the age and description of the victims, and are obviously very nervous about this stranger taking an interest in her. Is he or isn't he? -7- This last item I am SUPER excited about! Michelle over at Liturgical Time is hosting a Jesse Tree ornament swap. She needs 32 participants to make ornaments (so you would make the same ornament for 32 people, and send them to Michelle), and in exchange you will receive a package of 32 different handmade ornaments to decorate your Jesse Tree for all of Advent. :) The ornaments all relate to the story of Jesus' ancestry and birth. Who else is a craft fiend (despite not being all that talented with them)?!?! Anybody with me?! I think this would be beautiful, and I *adore* having items that are handmade by people I admire. It's why I collect rosaries and headcoverings with such abandon. hee hee! Do go read Michelle's post and leave her a comment if you're interested! Ok, I'm off to teach. 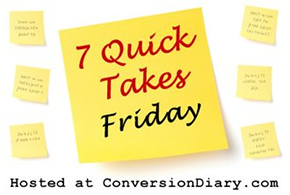 Check out other 7 Quick Takes at Conversion Diary! Found you through 7QTs. HOW DO I NOT KNOW YOU ALREADY!?!?! 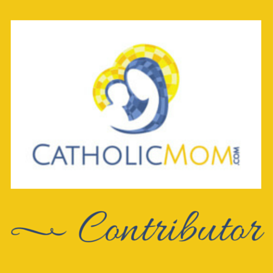 I'm a wife, hope-to-be-mom-someday, in library school, work at a library...oh yeah, Catholic too, haha. Looking forward to reading more of your posts! So glad you found me!!! Yes, please do keep reading. I'll check out your blog as well. :) Welcome!